Achieve the curative environment your healthcare facility desires with our stylish & highly functional hospital cubicle curtains & hardware. Every one of the hospital cubicle curtains we manufacture is code compliant & meets or exceeds NFPA 701 requirements for vertical flammability. In the United States today, the construction industry accounts for about 1/3 of all energy, water, and materials consumption and generates similar proportions of pollution. 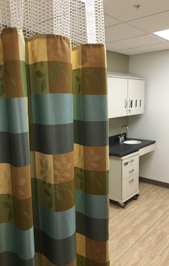 We at Hospital Curtain Solutions believe that providing a healthier and more sustainable selection of hospital cubicle curtains is every privacy curtain manufacturer's responsibility. Fortunately, there are an ever growing number of cubicle curtain fabric mills and curtain manufacturers who are taking on the task of changing the way we renovate healthcare facilities and manufacture hospital curtains, providing numerous benefits to the care of both patients and our planet, while still keeping a keen focus on great design. Depending on your healthcare facility's choice of hospital curtains, the air quality of the modern patient room can actually be improved, benefiting not only your patients, but the staff who care for them. The hospital cubicle curtain fabrics used in the manufacture of many of our high performance LEED and GreenGuard certified hospital cubicle curtains no longer require the toxic finishes that exist on many hospital privacy curtain textiles, and silver threads woven into our eco-friendly Bioactive cubicle curtains kill pathogens naturally, without treating them with chemical bactericides. While 'Going green' doesn't mean spending a lot of green, we also offer a full selection of economically priced solids and stylish conventional hospital curtains to choose from. We know your time is valuable, so we make shopping for cubicle curtains as easy as a click of your mouse. By clicking on the green shopping cart icon at the top right corner of every page of our website, you will find a wide variety of colors, patterns, pricing & availability for many of our hospital cubicle curtains, all broken down into categories, by style, price and characteristic, all for your convenience. If you are just looking for cubicle curtain track or components, you can also find pricing for our selection of heavy-duty hospital curtain track, carrier hooks & hardware by clicking the same green shopping cart icon and following the cart link for "Hospital Cubicle Curtain Track” to find pricing on track & components. We feel confident that our hospital cubicle curtain & track selection has something to fit the budget of every hospital, medical clinic, assisted living residence, physical therapy center and home healthcare provider. Proud Supplier of Hospital Cubicle Curtains to Showtime Series Homeland, starring Claire Danes & Mandy Patinkin, the ABC Network Series Quantico, starring Priyanka Chopra & Johanna Braddy, the upcoming New Line Cinema Production Isn't It Romantic?, starring Liam Hemsworth & Rebel Wilson, the HBO Series Big Little Lies, starring Nicole Kidman & Reese Witherspoon, the CBS Network Series Madam Secretary, starring Téa Leoni & Tim Daly, and the ABC Network Series Grey's Anatomy, starring Ellen Pompeo & Justin Chambers. The GREENGUARD Environmental Institute (GEI) has established performance based standards to define goods with low chemical and particle emissions for use indoors, primarily building materials, interior furnishings, furniture, cleaning and maintenance products, electronic equipment, and personal care products. Bioactive Textiles reduce the formation and growth of bacteria in textiles by adding carrier-bound silver to the fiber polymer. This also reduces the frequency of wash cycles/water use of Trevira CS Bioactive textiles. The antimicrobial properties, as well as the flame-retardant effects, are permanent. Eco Intelligent Polyester, the “First Technical Nutrient textile”, is a synthetic textile designed for sustainability from start to finish. A technical nutrient is a material that remains in a closed-loop system of manufacture, reuse, and recovery, maintaining it’s value through many product life cycles. The LEED green building rating system -- developed and administered by the U.S. Green Building Council, a Washington D.C.-based, nonprofit coalition of building industry leaders -- is designed to promote design and construction practices that increase profitability while reducing the negative environmental impacts of buildings and improving occupant health and well-being.